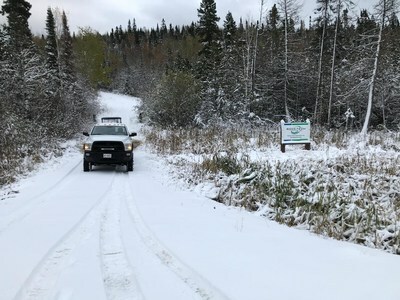 VANCOUVER, Oct. 25, 2018 /CNW/ - Rock Tech Lithium Inc. (the "Company" or "Rock Tech") (TSX-V: RCK; Frankfurt: RJIB) is pleased to announce that it has mobilized a trenching crew to the McVittie area of its 100%-owned Georgia Lake lithium property in the Thunder Bay Mining District of Northwest Ontario, Canada. Martin Stephan, Chief Executive Officer of Rock Tech, commented, "We are excited to begin the trenching program following up on the positive results from our Preliminary Economic Assessment announced October 2, 2018. The program is aimed at developing drill targets for future resource definition drilling to increase our resource tonnage further and to build up the McVittie area as a second main resource zone of our property." The McVittie pegmatite, located south of the Nama Creek pegmatite which hosts the majority of the Company's NI 43-101 resource estimate, was the focus of a drill program conducted in 1955 and 1956. In total, twelve (12) holes were drilled over 544 metres. During 2016, ten (10) channels were cut and forty-seven (47) samples taken during a trenching program. The purpose of the channels was to gain information on additional pegmatites observed on surface and to better calibrate future exploration programs. The McVittie pegmatite hosts an inferred resource estimate, prepared in accordance with NI 43-101, of 670,000 tonnes (the Technical Report with resource estimate is available on the Company's website and on SEDAR). Additionally, the Company is pleased to announce the continued business relationship with Arriva Management Inc. ("Arriva") for mineral exploration and technical consulting work. Arriva will continue to provide technical geologic and strategic consulting to the Company to build upon the Company's successful exploration efforts. As partial compensation, Arriva will be issued common shares of Rock Tech, with a value of $39,000, payable in tranches after services have been rendered.